Perhaps one day a genius will discover a means to manipulate space and time and with a little defiance of the laws of physics, can create a full-fledged machine that is portal straight from a H.G. 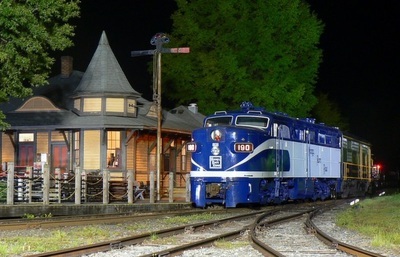 Wells novel. 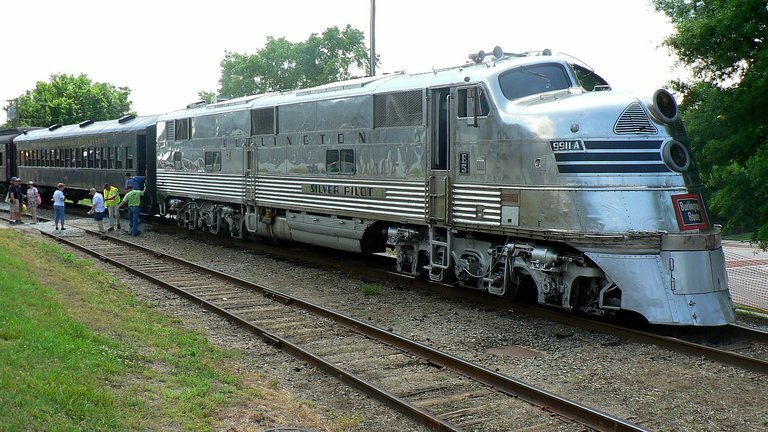 It could be used on a grand scale to visit specific eras in world history---past or future--or at a personal level, possibly loved ones that have since departed the scene. 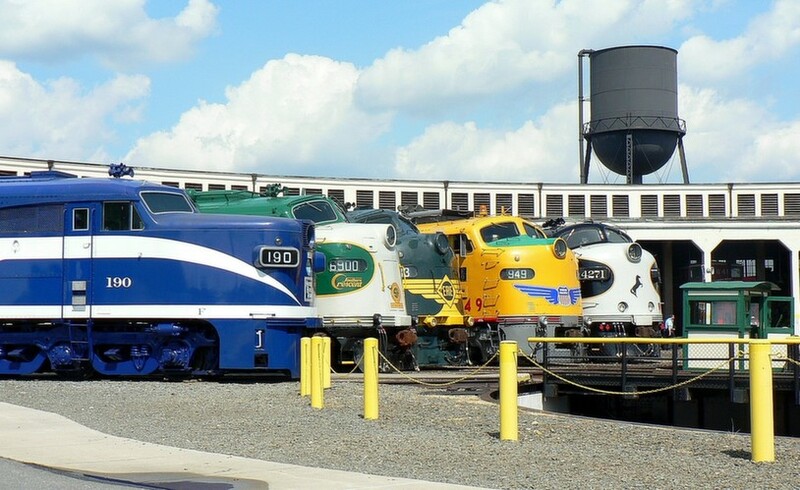 For the rail enthusiast or historian, a myriad of possibilities also exist. But for one weekend at Spencer, NC, no such machine was necessary. 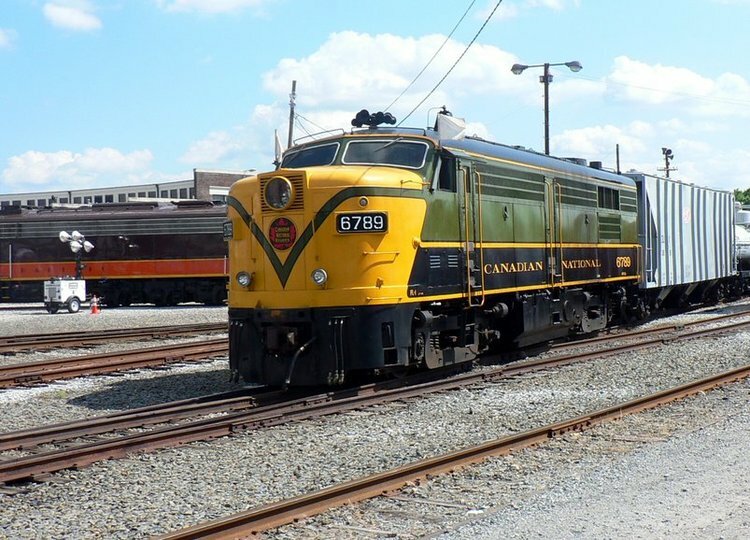 Thanks to the efforts of numerous entities, the North Carolina Transportation Museum (NCTM) became a corridor back into time like never before. Mr. Wells would have been impressed. For the railfan interested in the transition era of steam to diesel, the Spencer Streamliner Event was a Shangri-La. 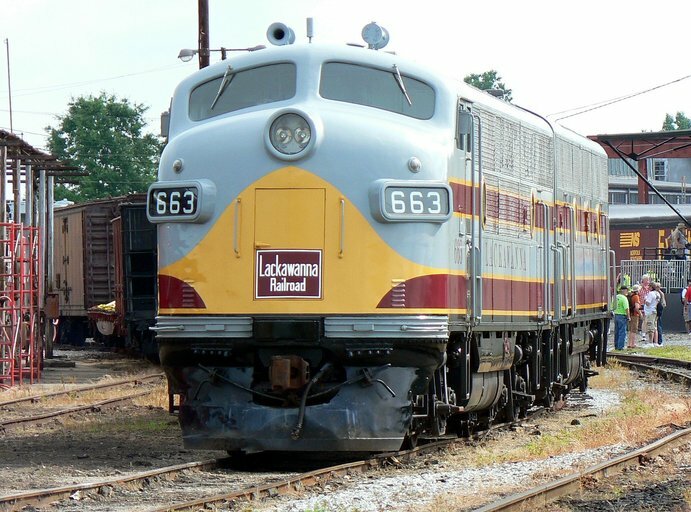 A reflection of a long since vanished period when Class I railroads were numerous and each possessing its own charms and characteristics. 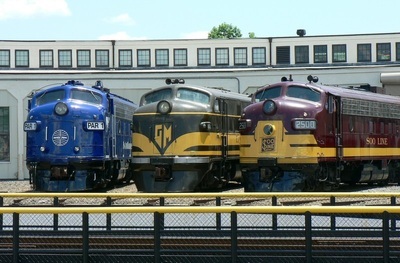 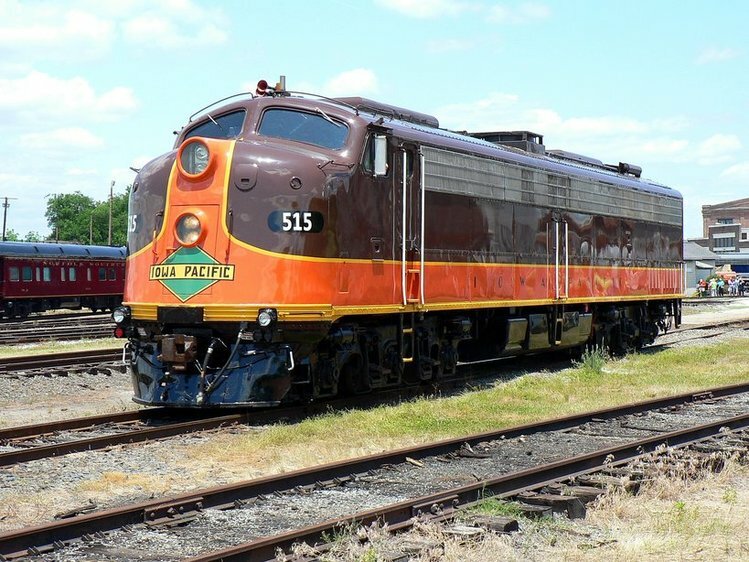 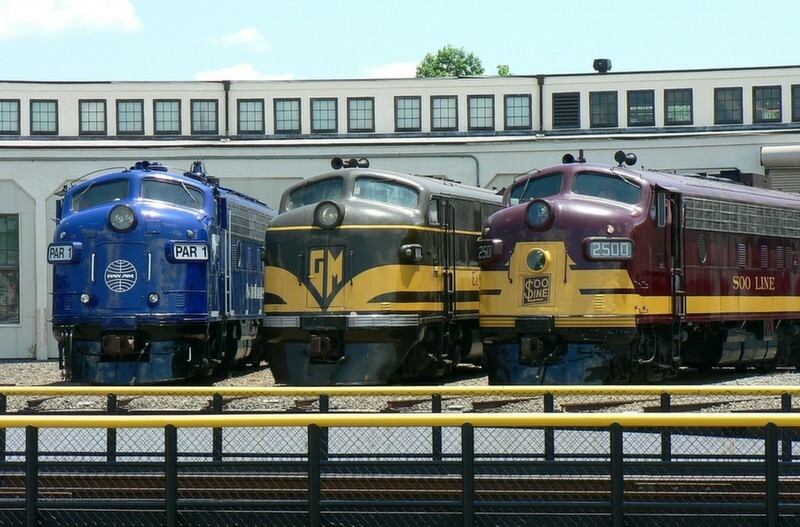 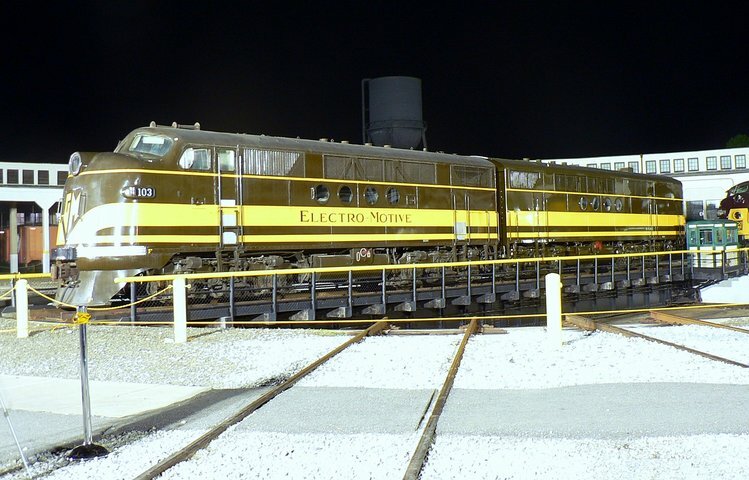 These locomotives offered a taste of how the railroad scene once existed with individual roads displaying pride in the equipment as a both a company and its appeal to the public. 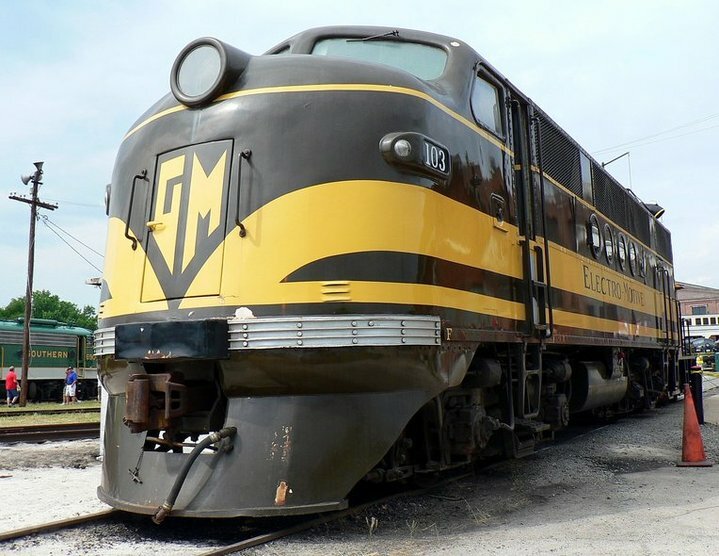 Trains were truly a rolling billboard in the post - World War II era in a vast array of color schemes and models which further etched the era in our collective memory. 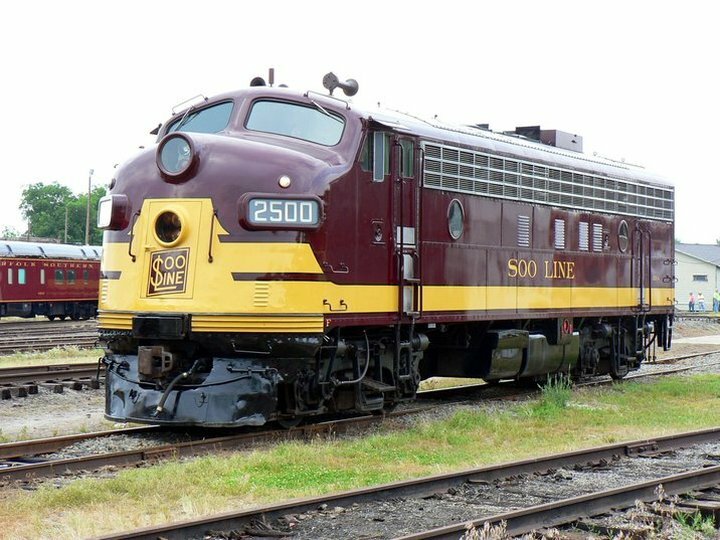 It stands out as a stark contrast to the comparatively generic and utilitarian railroad industry as it exists today but for few exceptions. 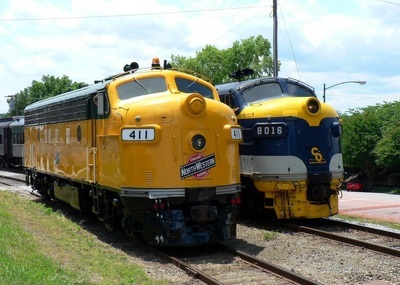 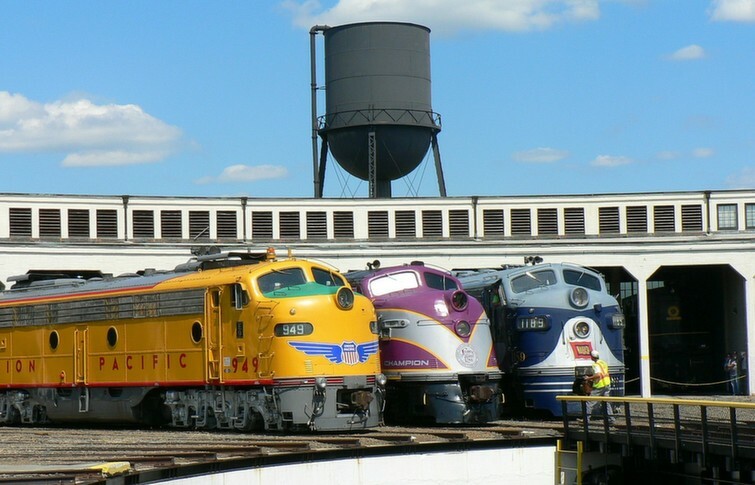 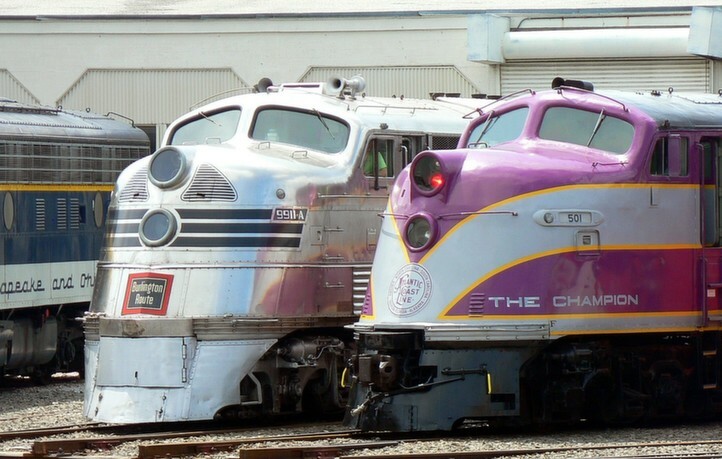 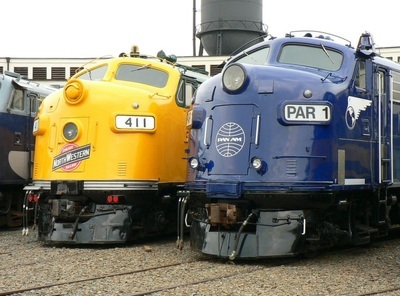 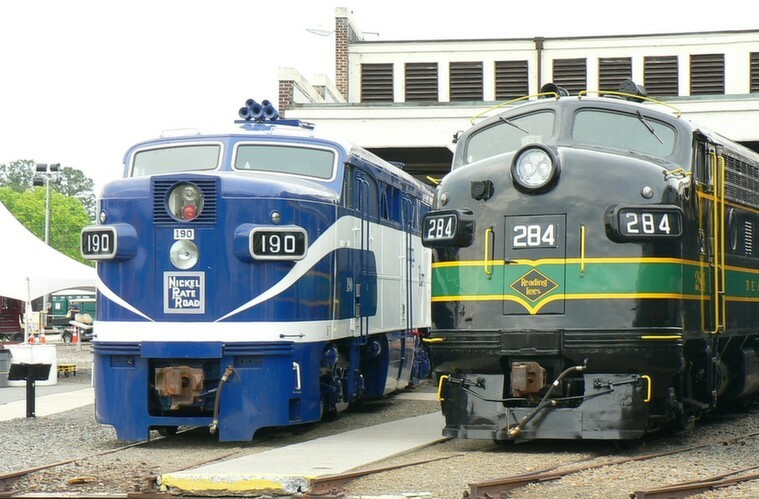 As a result, the gathering of classic locomotives served a dual purpose. 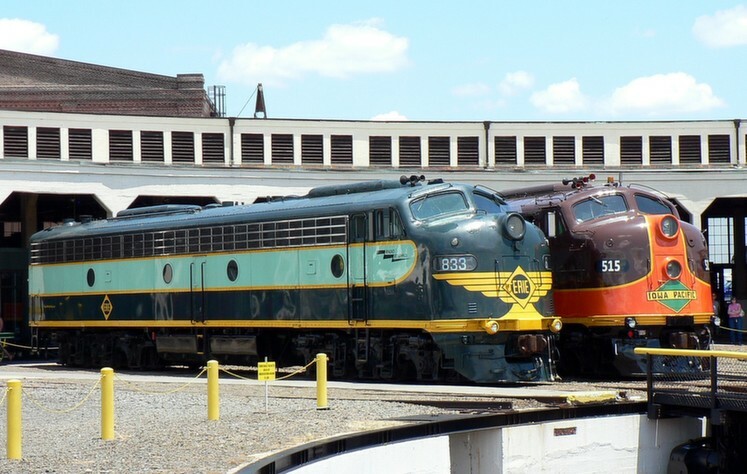 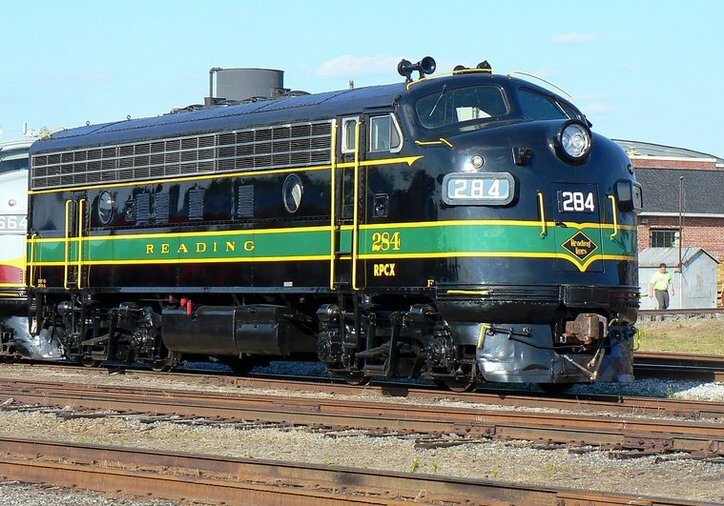 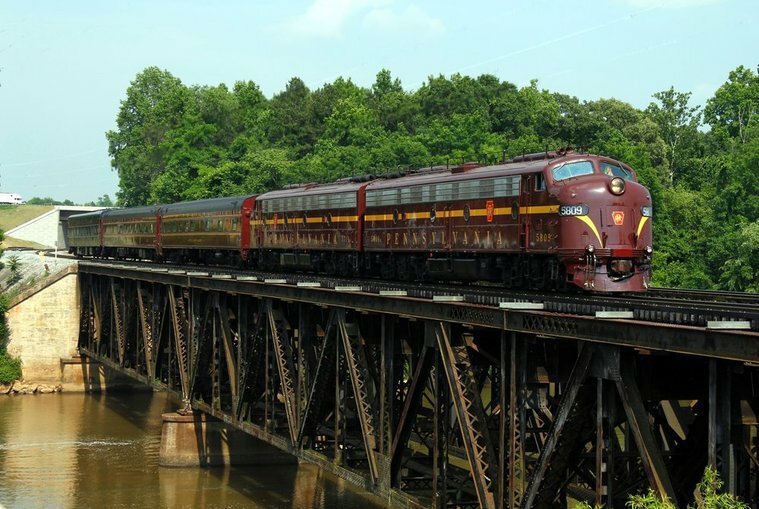 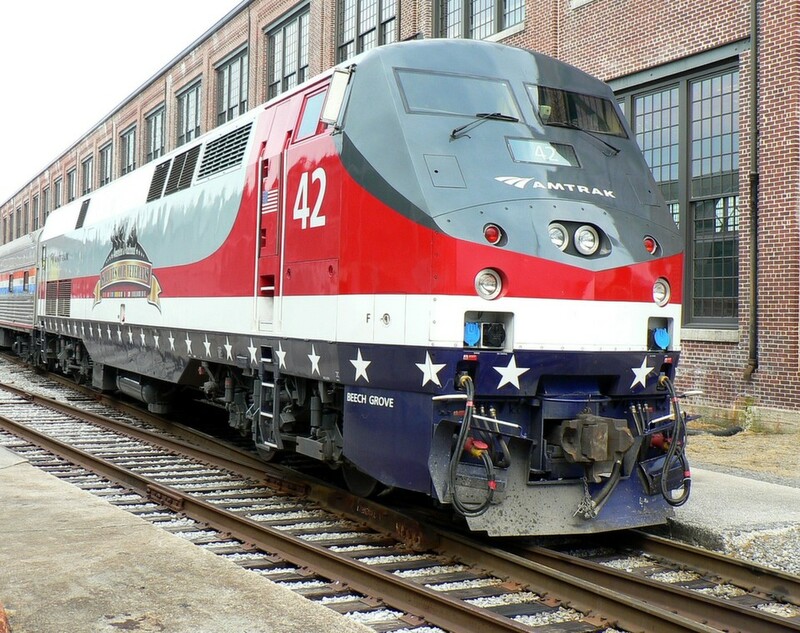 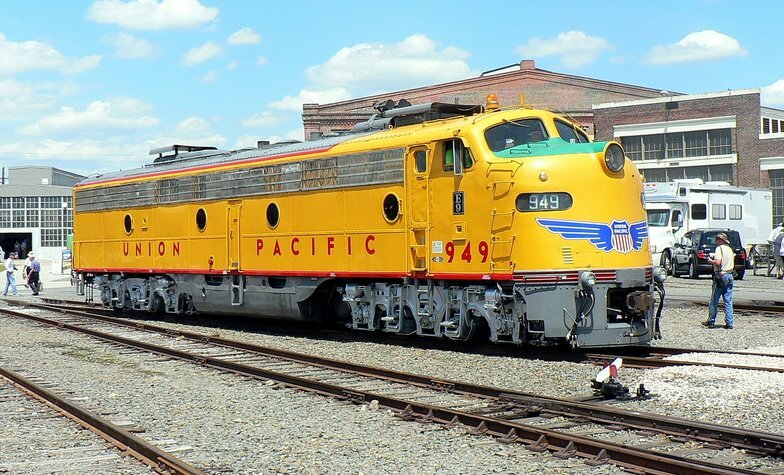 For older generations who recollect the era when these beauties graced the rails in large numbers, it was reminiscent of a long ago childhood or perhaps a flashback to a scene at a Union Station in Chicago or Washington, DC. 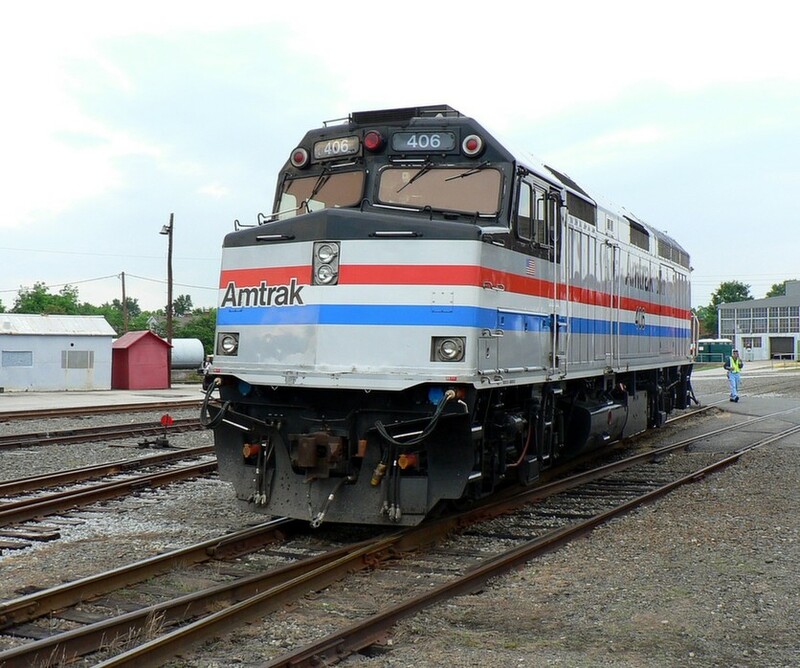 For younger generations accustomed to a modern scene saturated with wide cab diesels, a national Amtrak passenger service, and undistinguishable rights of way, a gained appreciation of a glorious past punctuated with the thought "hard to believe railroads once looked like this". 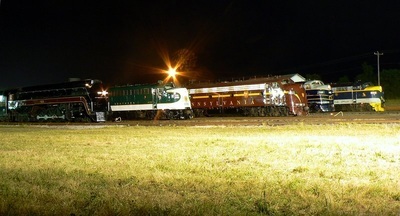 As for this four day event itself, it was a huge success and was coordinated well. 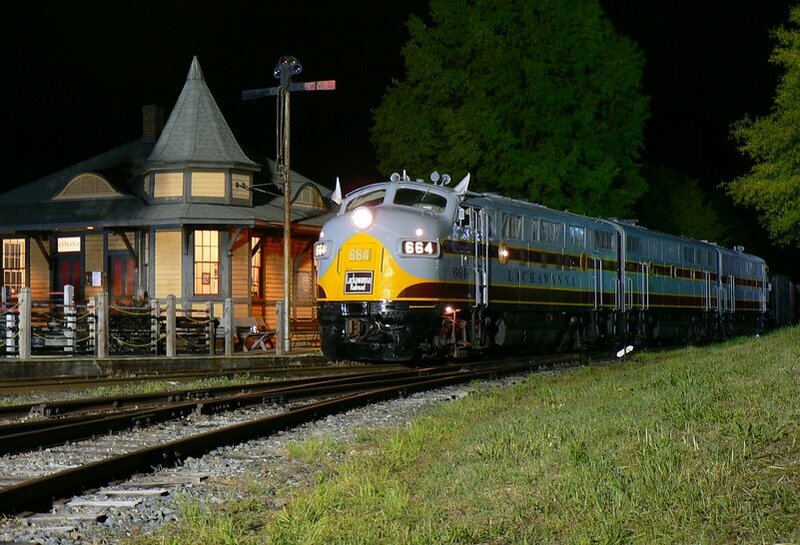 In spite of large numbers of visitors, complaints were few and compliments to its itinerary many. 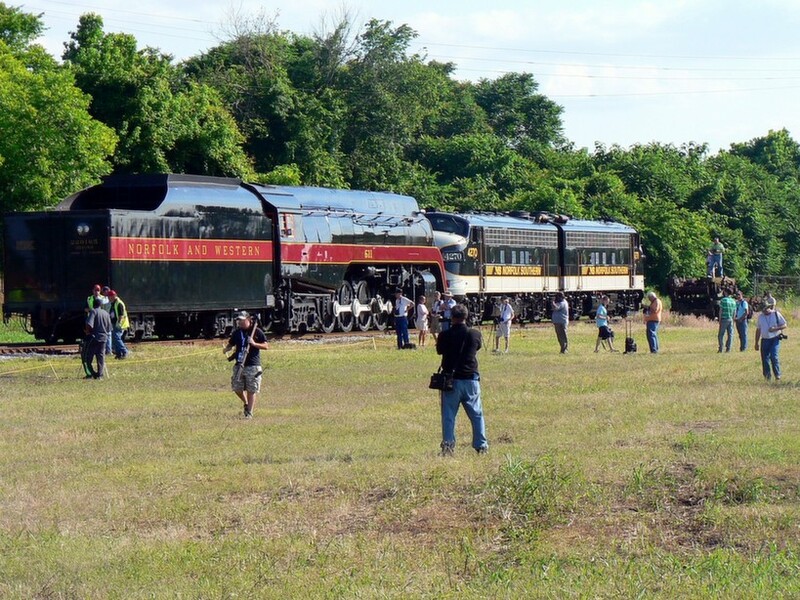 To be fair and candid, there are minor improvements that could have been made but these did not diminish the collective impression left on an overwhelmingly large number of visitors to the event. 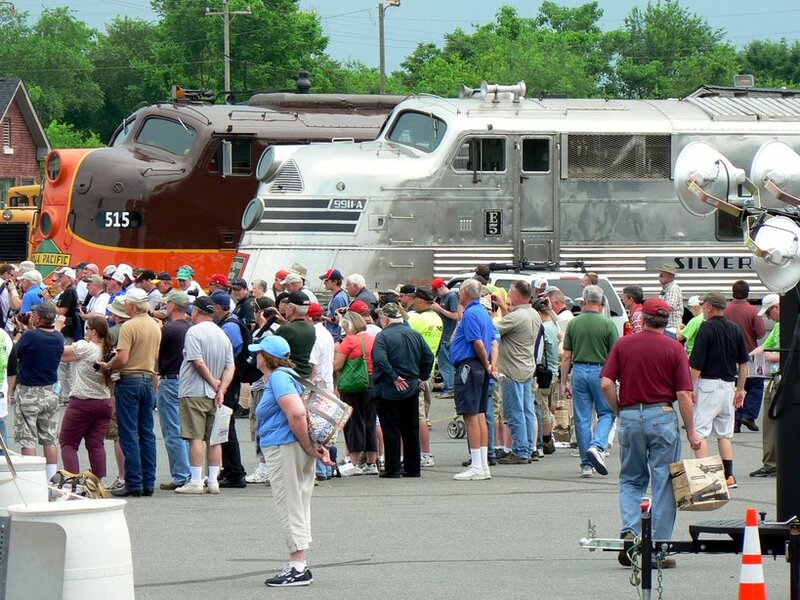 It must not go unappreciated the exhaustive effort by NCTM volunteers, railroad personnel, and vendors over a four day period to make the Streamliner Event a huge hit. 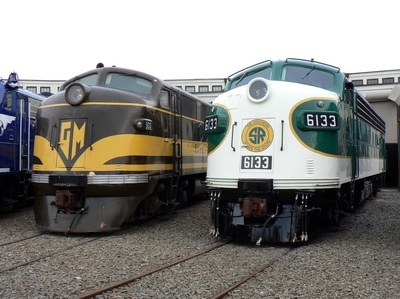 Lest we forget the museums and/or owners that maintain these locomotives for agreeing to their use at Spencer. We are most grateful to all. 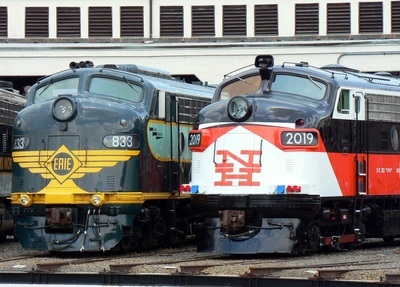 Inevitably, comparisons have been made between this event and the NS Heritage Unit gala in 2012. 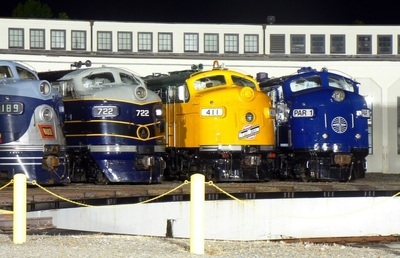 Which was best? 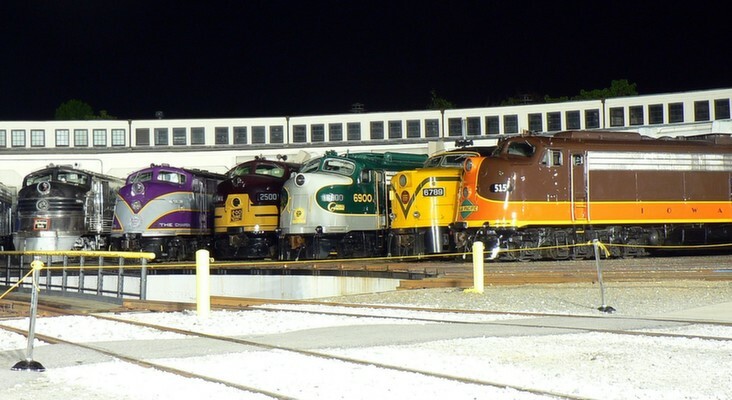 That is for each individual and his or her personal taste to decide. Statistically, comparing the two is like apples and oranges. 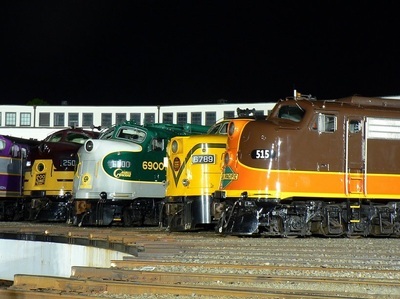 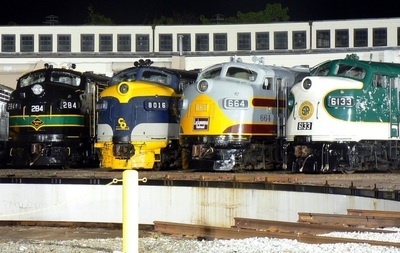 NCTM officials estimate 9200 visitors for Streamliners and 4600 for the Heritage Event. 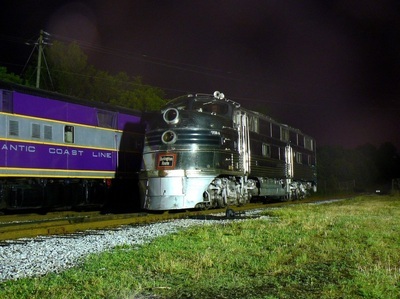 Whereas Streamliners was four days, Heritage was two. One was considered a broader range appeal (Streamliners) whereas the other was more regional (Heritage). 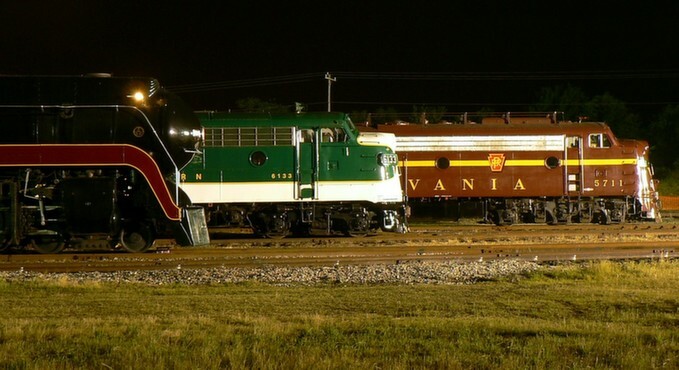 Obviously, there are exceptions to both. One fact that is without debate is that both of these events escalated the NCTM from a regional showcase to what is now a national platform. Below is my photographic record of the Streamliner Event with descriptions sprinkled in. 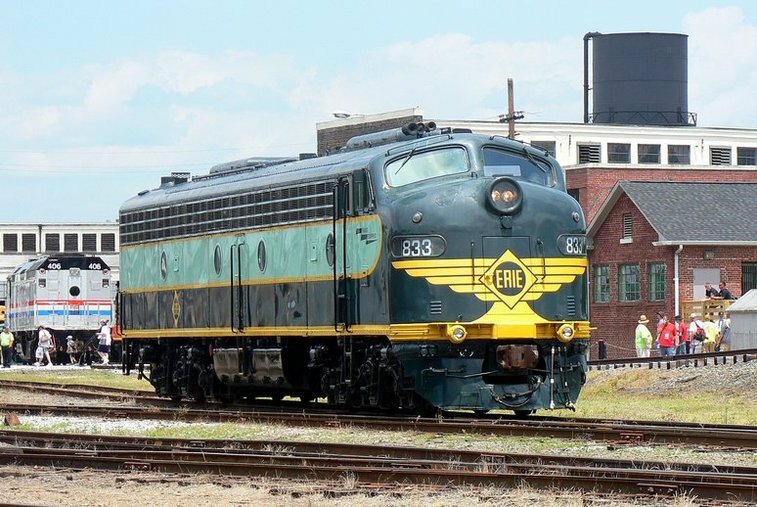 My wife and son are contributors to this piece as well for they captured some scenes while I was working and compiled brief historical data for each. 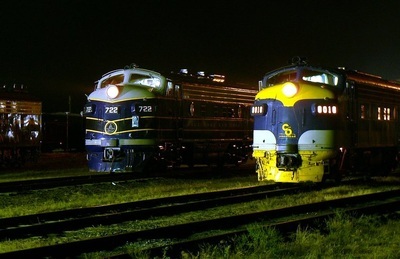 My images are quite humble compared to the high quality amateur and professional ones already on the internet or that will appear in publications. 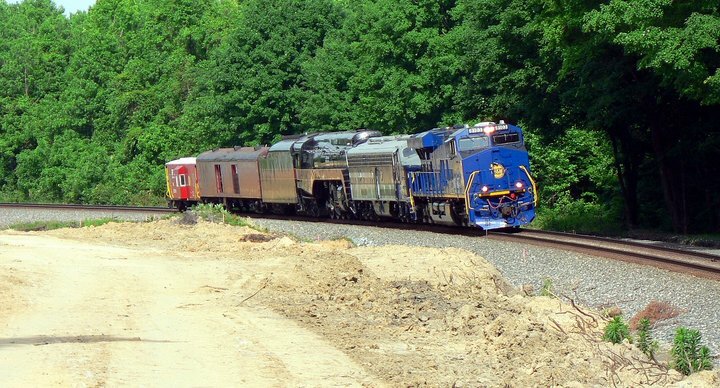 By the time one is reading this, the fanfare will have subsided to a degree as the extraordinary weekend slowly fades from the forefront. In any event, I hope the reader will enjoy the images presented from this unforgettable congregation. 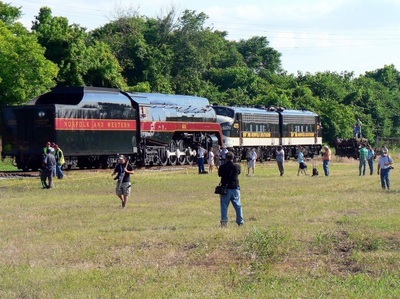 An event to and of itself, enthusiasts and photographers anticipated the gathering of the flock at Spencer. The arriving trains with these locomotives in the consists, whether on a freight or deadhead move, were chased and photographed as they made their way from various points in the country en route to North Carolina. This was certainly applicable with the departure of the locomotives as well. 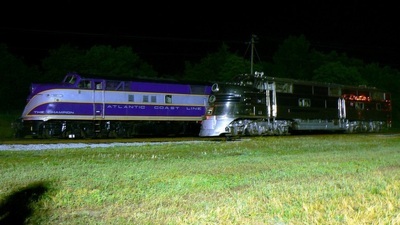 Below are various images of the some of the moves. 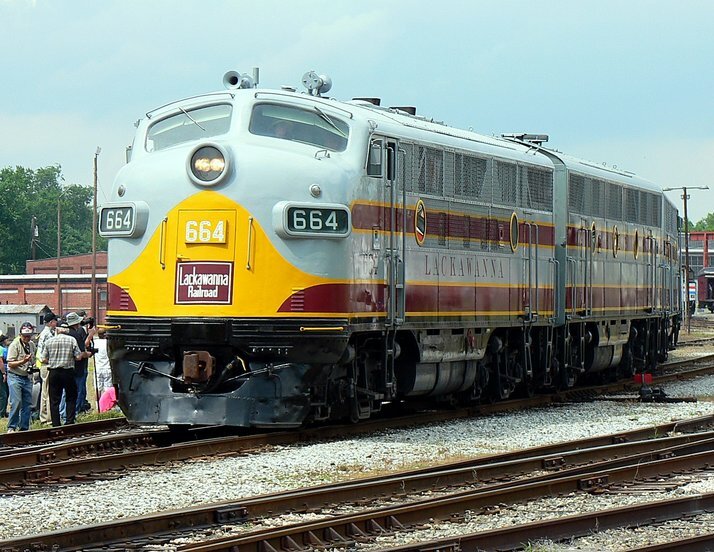 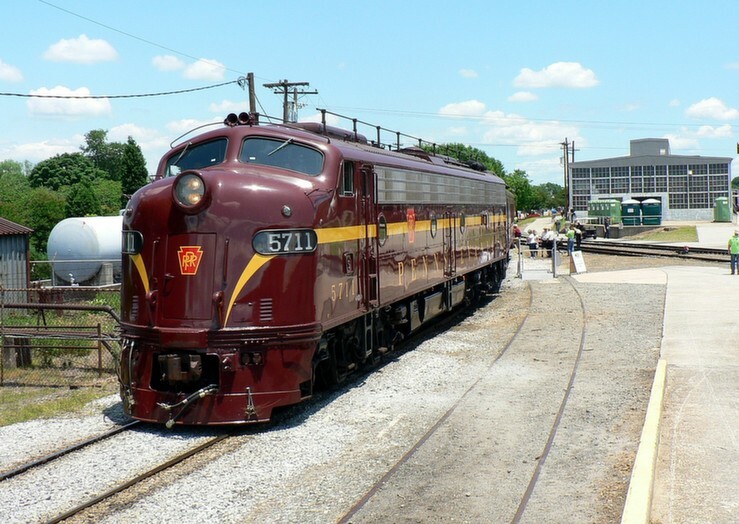 One of the major rail preservation stories of the past year was the announcement that the N&W J #611 would return to excursion service. 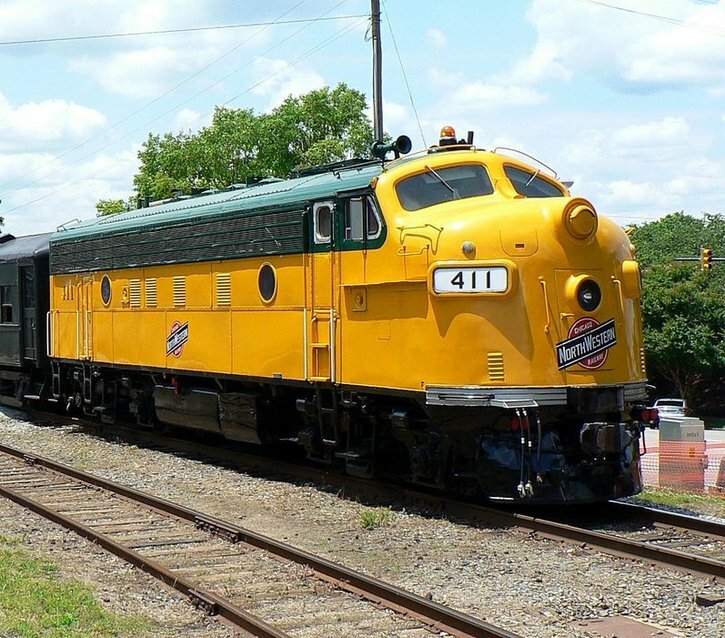 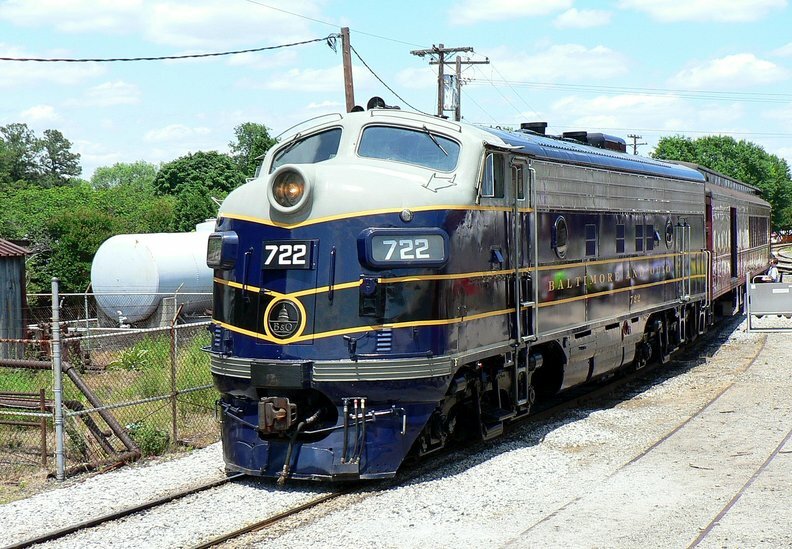 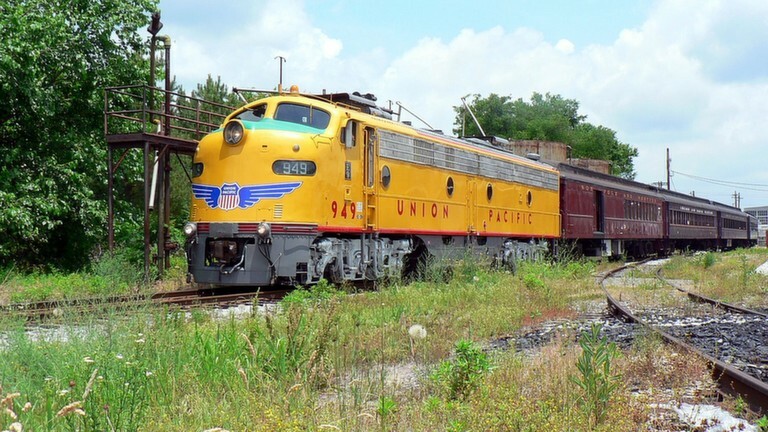 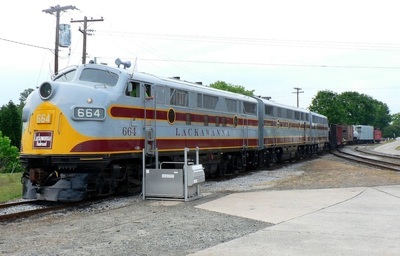 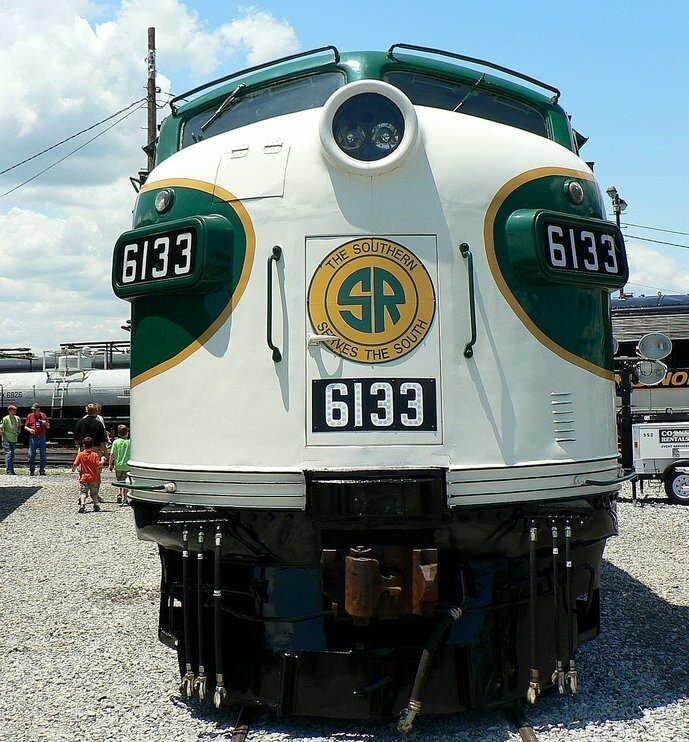 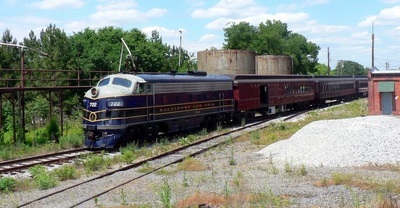 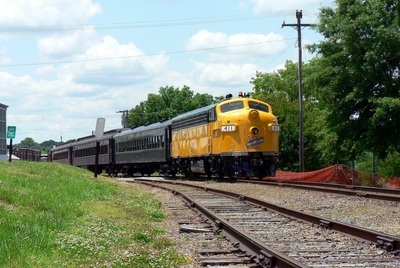 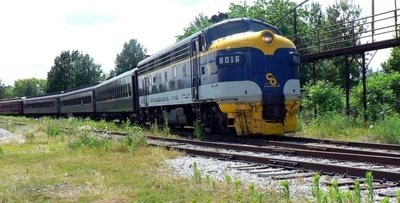 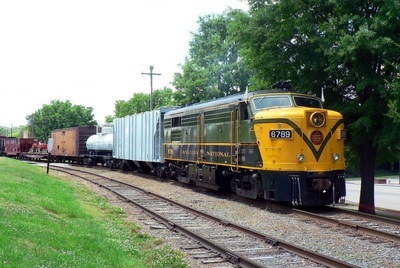 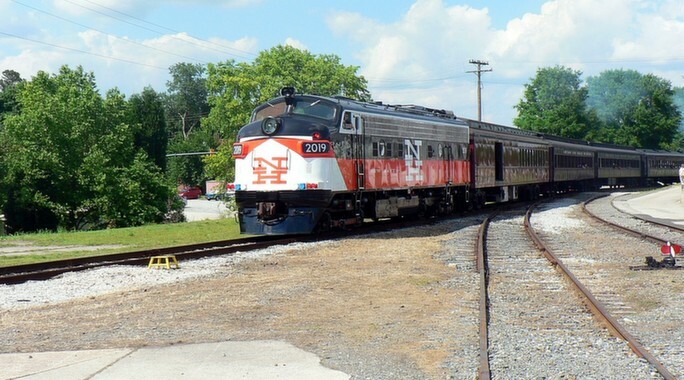 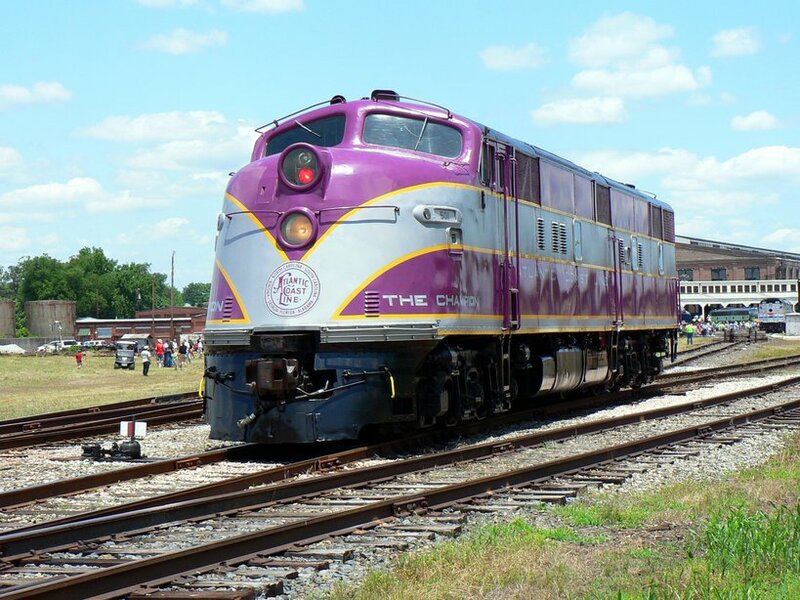 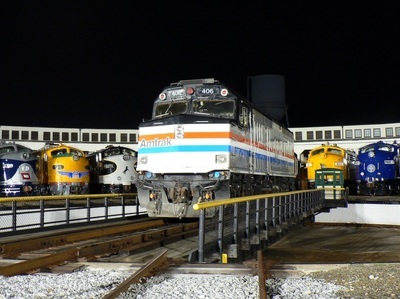 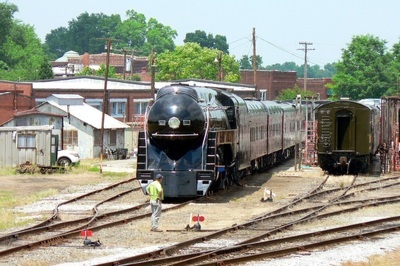 A fundraiser was held to raise money for its restoration it and was decided that the locomotive would be moved from the Virginia Transportation Museum to the NCTM at Spencer. 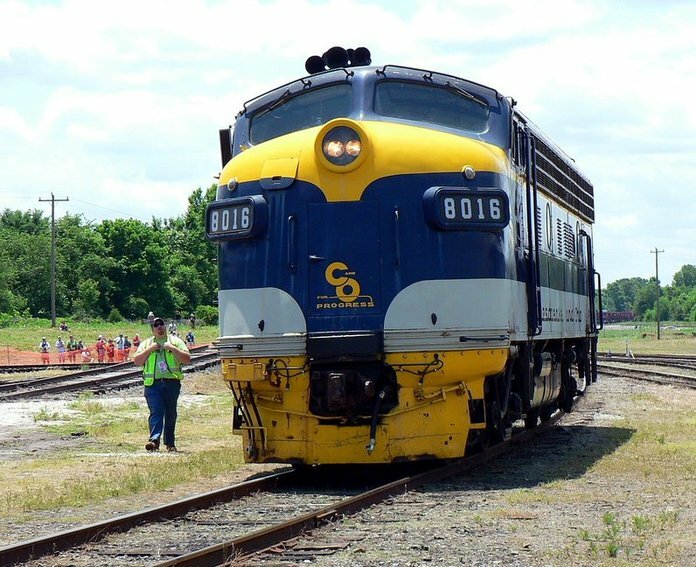 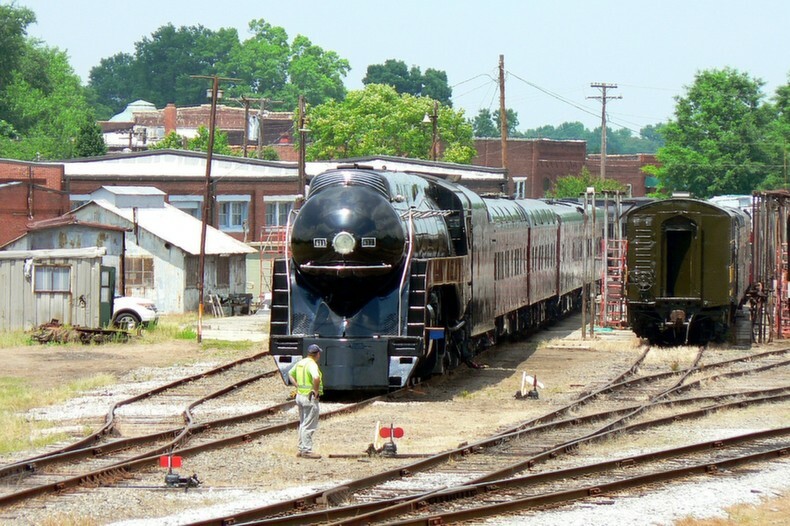 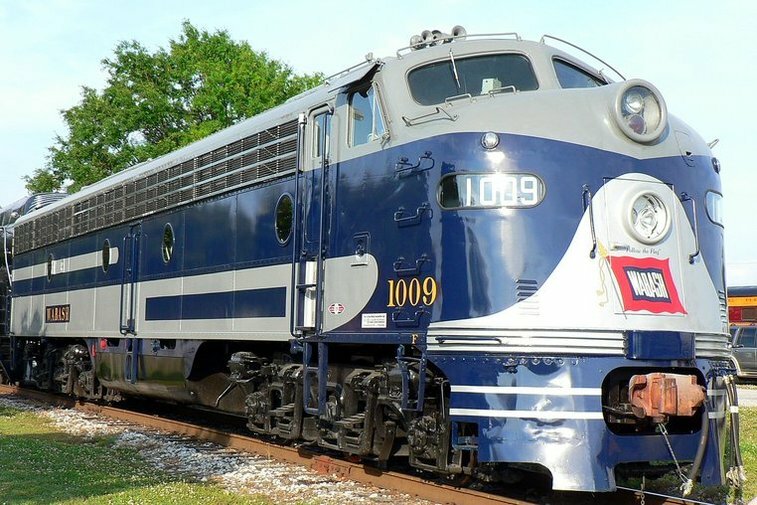 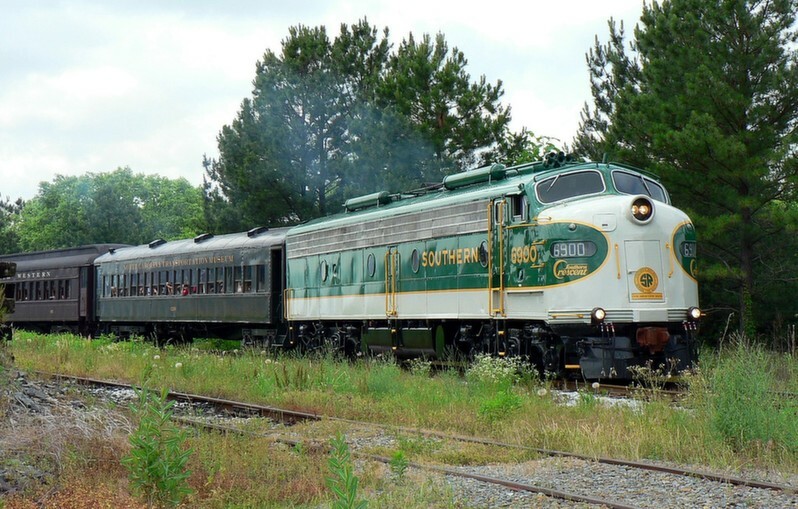 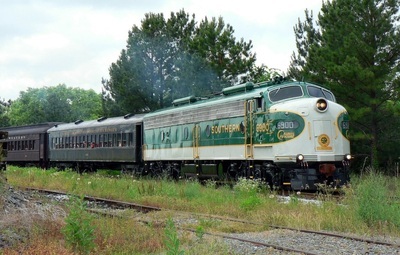 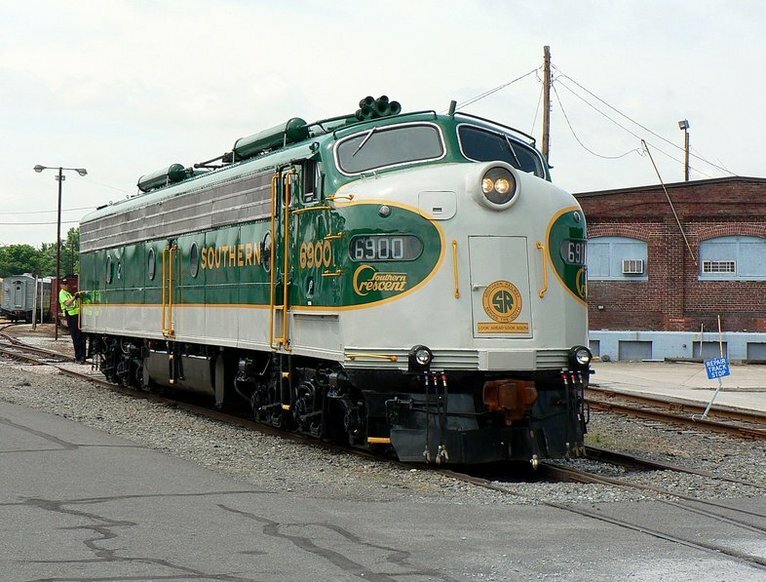 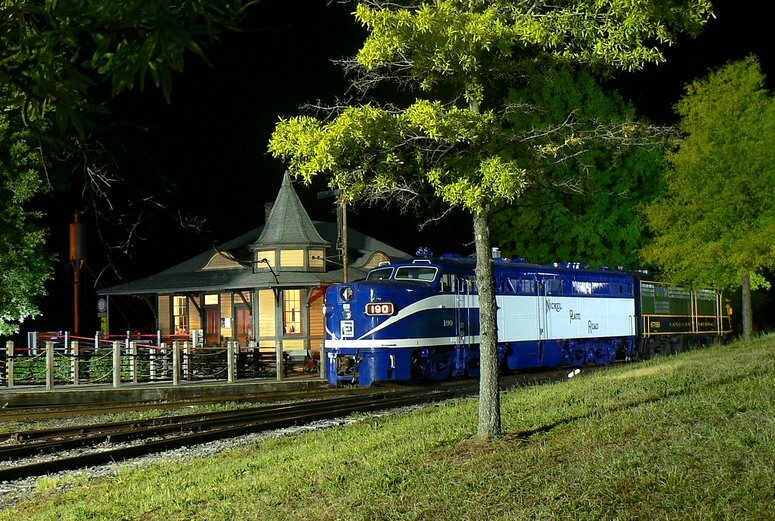 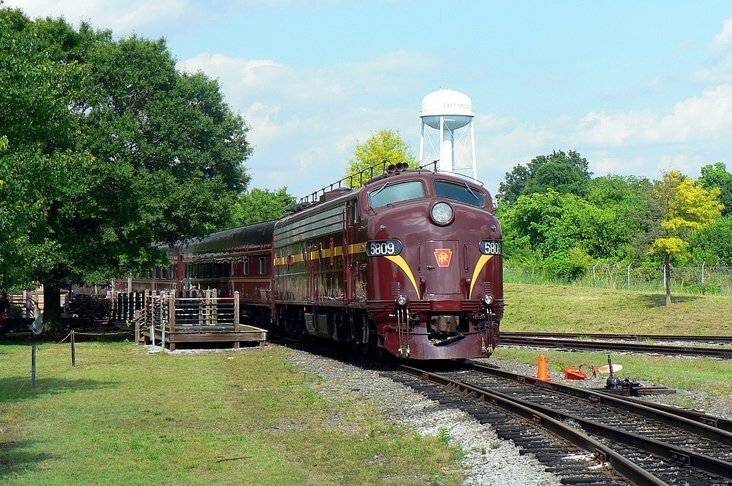 The Streamliner Event provided that opportunity to move the locomotive to North Carolina to begin restoration and to showcase it before an anticipating rail enthusiast community. 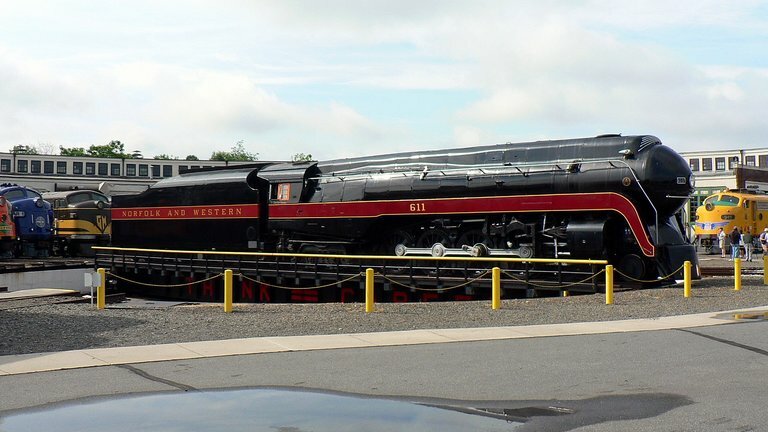 As one of the best known---and admired---excursion steam locomotives in the Eastern United States, the #611 was a mainstay on autumn excursions from the 1980s until 1994. 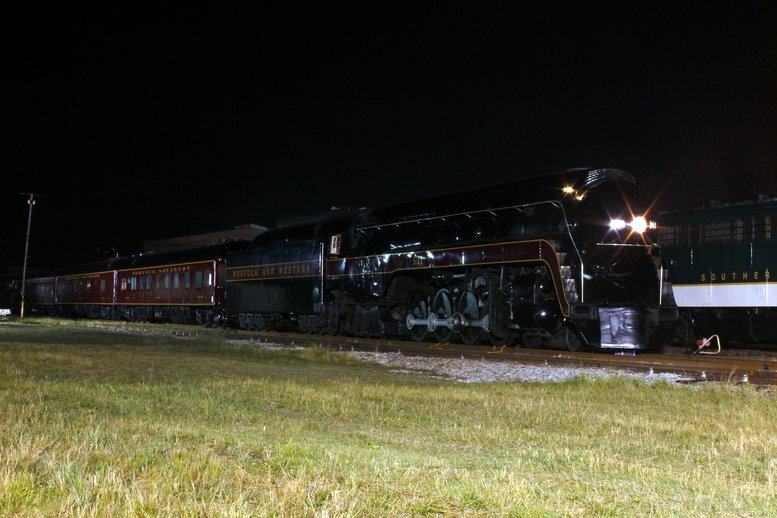 It was that year that steam powered excursions came to an end and the locomotive would spend the next two decades on static display at Roanoke. 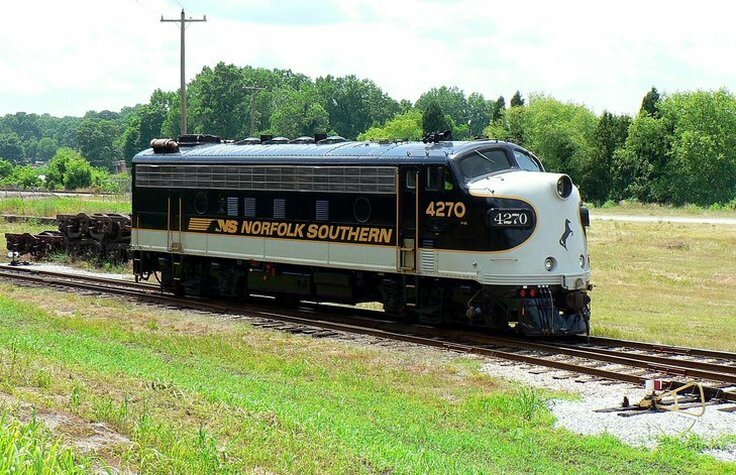 Built as one of fourteen J Class 4-8-4s by the Norfolk and Western in 1950, the locomotive remained active until being displaced by diesels in passenger service during 1959. Fortunately, through the influential efforts of legendary photographer O. Winston Link and others the N&W recognized its heritage by keeping her preserved. 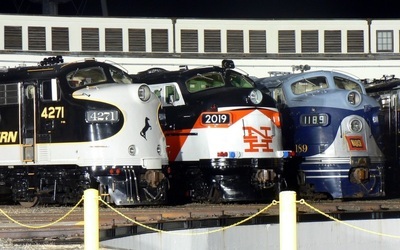 Amtrak was present for the Streamliner Event just as it was at the 2012 Heritage Event. 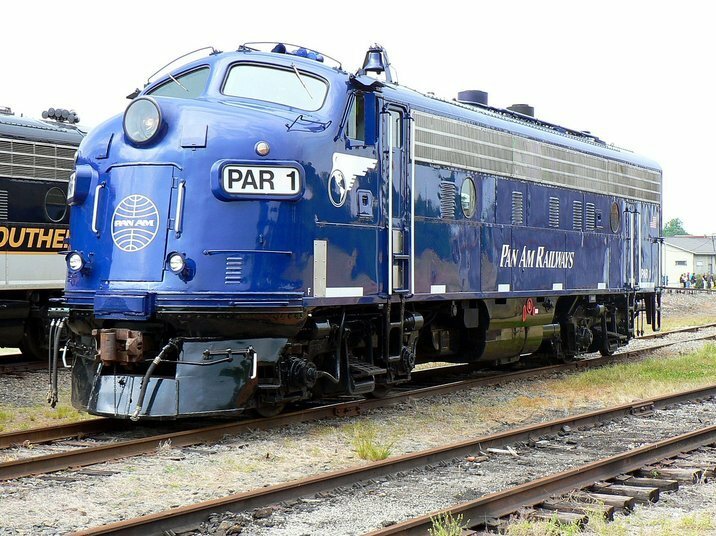 Its contribution was a train for display with Veterans locomotive P42DC #42 in addition to a Heritage series locomotive, F40PHR #406. Many toured the train and the respite of its air conditioning although the temperatures were not near as torrid as 2012. 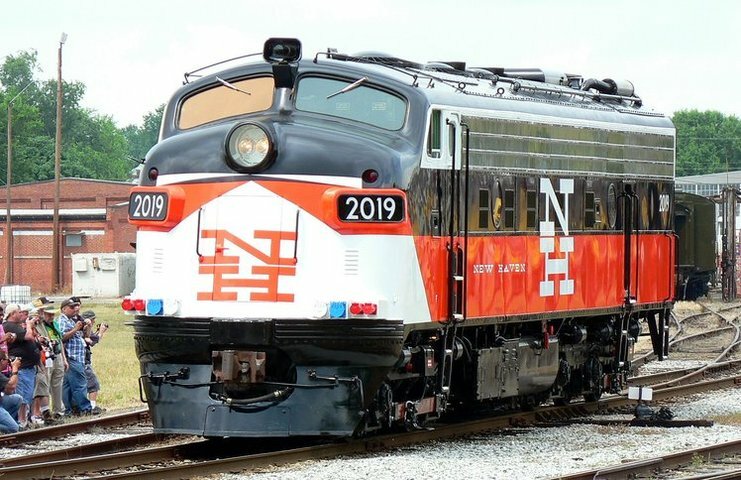 NCDOT also displayed a train for the event and quite honestly, I overlooked photographing it because I see them so frequently. 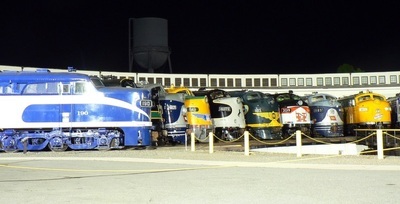 But in hindsight, I should have to include here in context with the event. 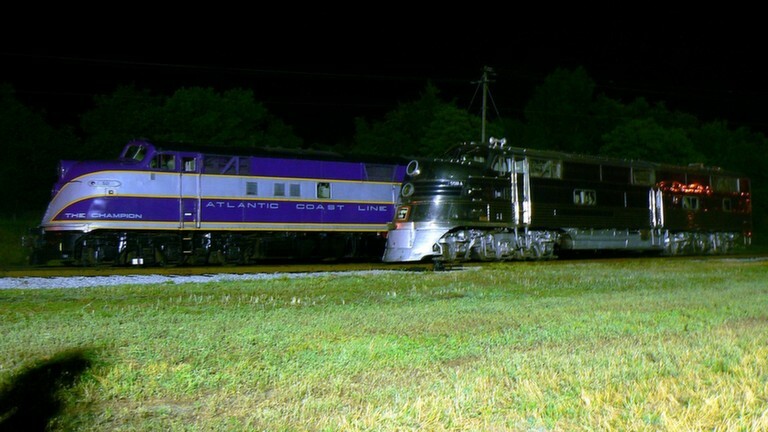 Night photography is definitely not my forte but below are numerous images of varying states in quality. 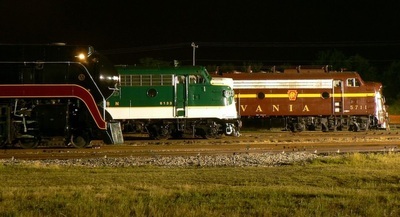 It is a fine art and I greatly admire the efforts of those who have mastered it. The Streamliner Event will be one of the most recorded rail events in history. 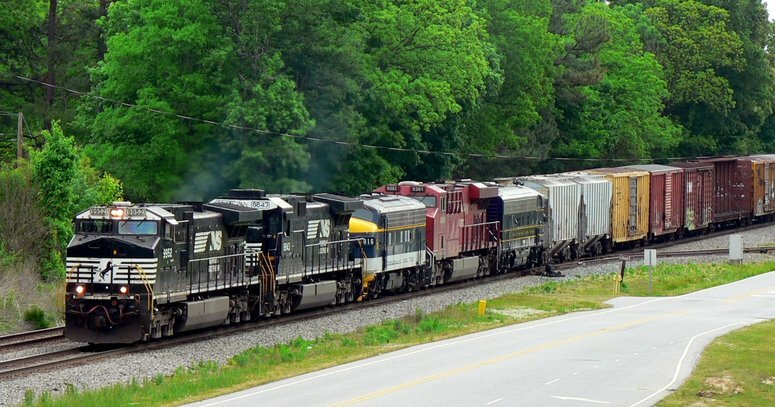 Images will be virtually everywhere---videos, publications, calendars, books, and on a host of locations scattered across cyberspace. 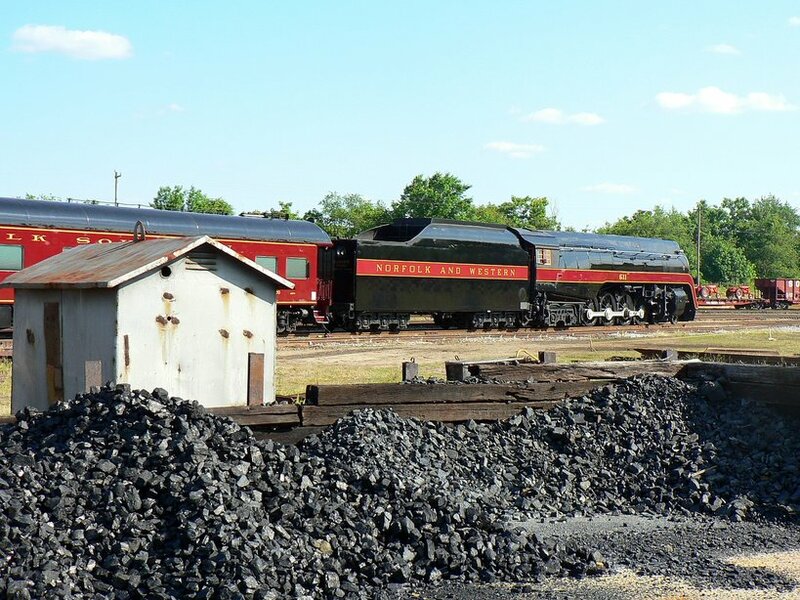 Scores of aerial images will exist as a private outfit provided helicopter rides for photographers at $50 a trip and it could be seen and heard virtually non-stop during the event. In a nutshell, there will be no dearth of information about this historical event in the years to come. 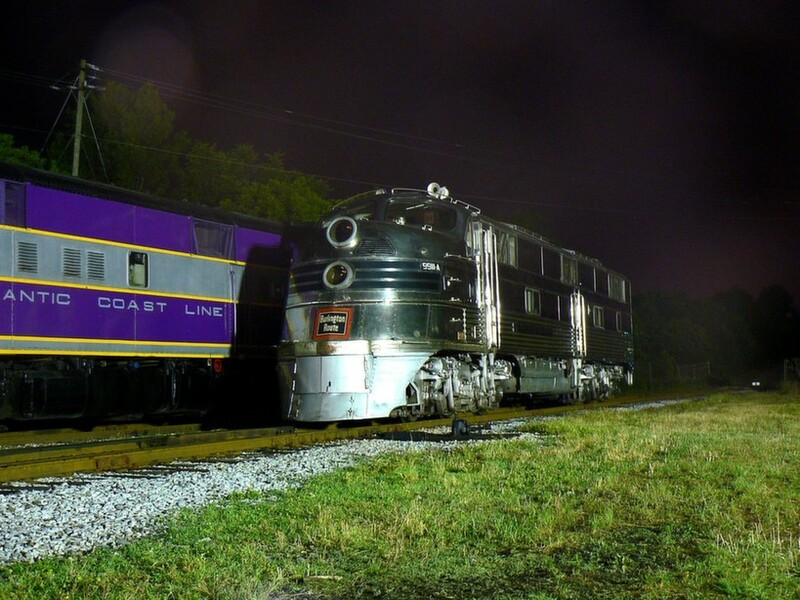 As exclusive as the Streamliner Event was, the potential exists for such another undertaking. There are more candidates representing fallen flag railroads that could be summoned for an encore of sorts at a future date. 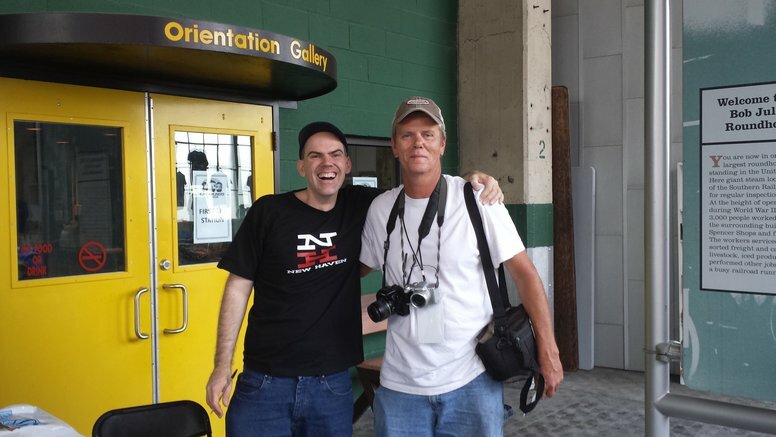 No doubt any of the stars from the recent gathering would be a welcomed reprise. A notable omission from this event was a Santa Fe Warbonnet locomotive. 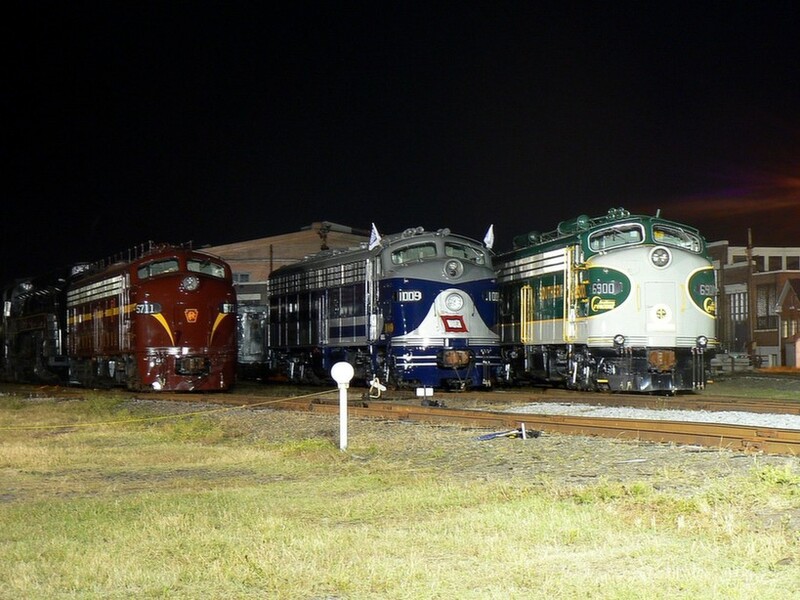 Although there are certainly numerous fallen flags not represented this time, the absence of Santa Fe is the most conspicuous. 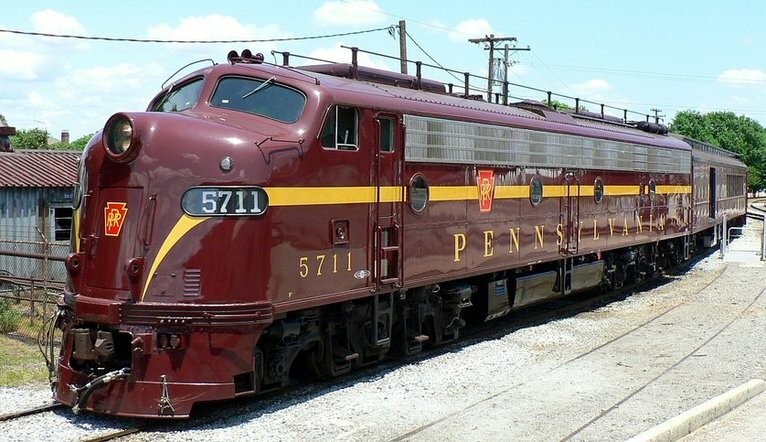 Arguably the most recognizable paint scheme ever applied to a diesel, the presence of a cab unit in these colors would have further enhanced an already spectacular assemblage of power. 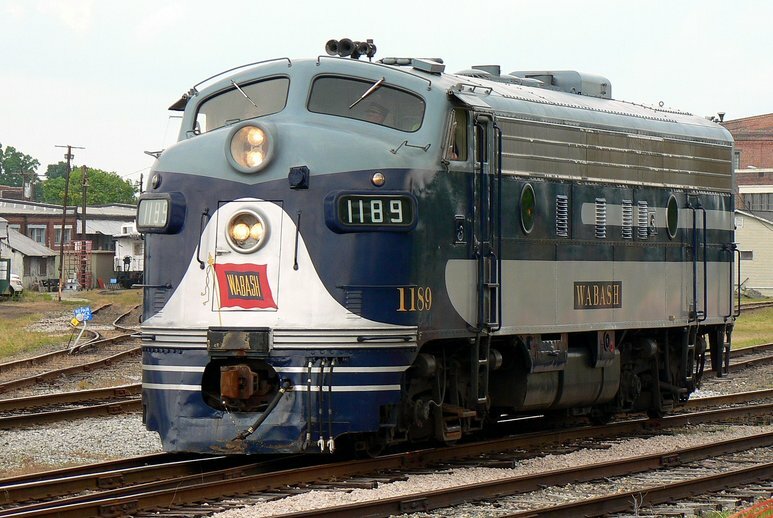 Perhaps another time. 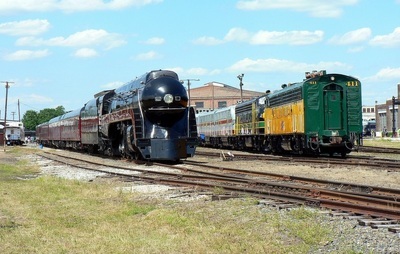 All indications are that the next major event at Spencer will be steam related. 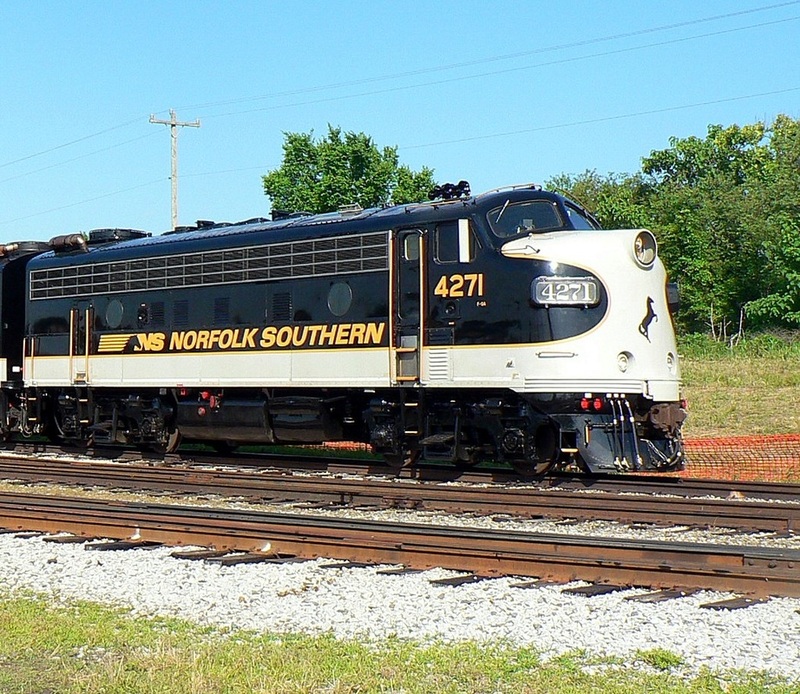 A restored N&W #611 in conjunction with an existing Norfolk Southern 21st Century Steam program places the pen to the wall in this regard. 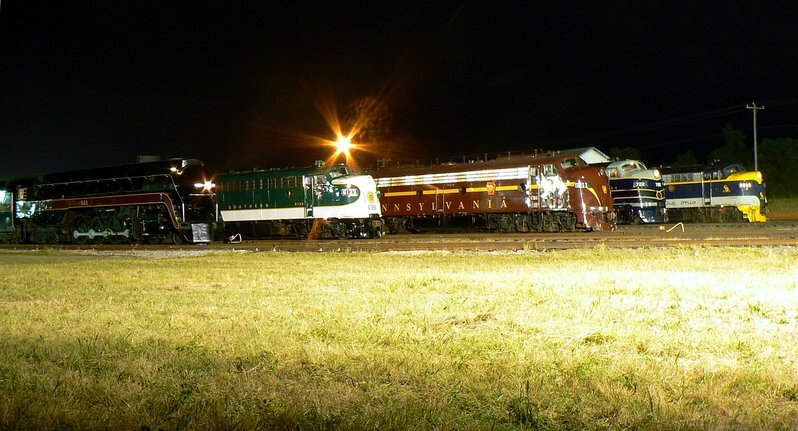 Such an extravaganza would obviously be another successful coup on the part of the NCTM and NS.